The words of MIT president Susan Hockfield at this morning’s launch of the 150th anniversary celebration. 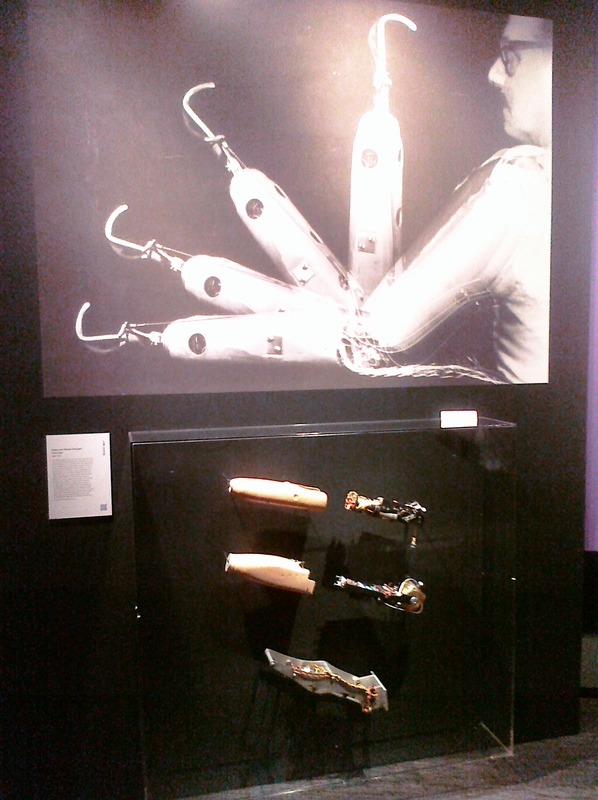 We got a sneak preview of a dazzling exhibition which, it’s fair to say, has something for everyone. The world’s first ‘bionic’ arm? artificial skin? a wheelchair that can climb stairs? 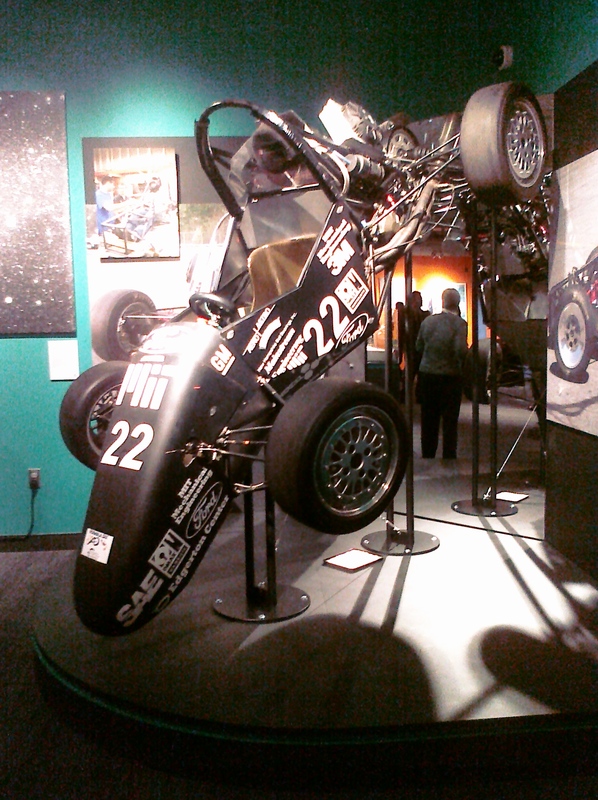 students earning credits for racecar design? The motto for this 150 years is “inventional wisdom”. I like it. It’s also very much in the spirit of MIT culture that this is the result of open source curation – the entire MIT community was invited to nominate objects for inclusion. They say the real difficulty was deciding what to leave out since – as one of the professors put it – the intellectual experience here “is like drinking from a firehose”. The Nieman experience feels that way too, for which I’m eternally grateful. I’ve put more photos up on my twitter feed. You can see the exhibition at the MIT Museum in Cambridge – about five minutes walk from my house, so I’m hoping to get my son’s third grade class to take a trip, and see them “wowed” by science. If you go, try to chat to the curator Deborah Douglas, who just overflows with facts and enthusiasm. You wondered about the “ridiculous”? How about this? Apologies for the quality of my phone pic but it had to be done. 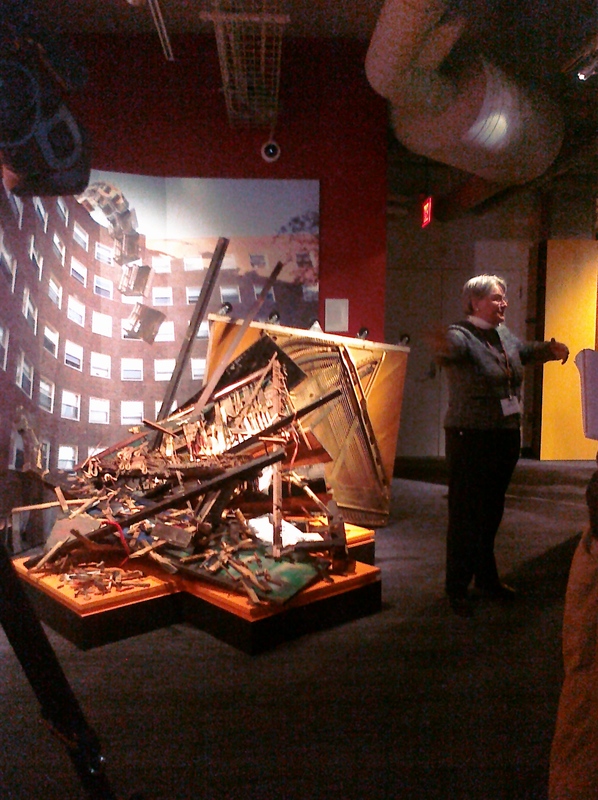 This is the curator showing us the 2010 record of the annual MIT piano drop. Uh huh. Piano Drop. In 1972 students at the Baker dormitories wondered What Would Happen if they dropped a full sized piano from the top of a six storey building. What would it sound like? The museum label for the exhibit deals with the obvious objection, though I wonder what you think. Here’s what it says: “Though this event was the top vote getter in the MIT Museum’s public competition to nominate and select items for this exhibition, it is controversial as some object to the destruction of a musical instrument. One participant responds ‘The Baker House piano drop is actually a combination of dorm spirit, harmless destructiveness, and the willingness to do something difficult just for the sake of doing it. '” So there you have it. Categories: new ideas, science | Permalink.